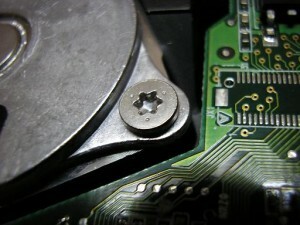 Home › Computer Maintenance Tips › Tutorial: How Do I Fix Computer Hard Drive Errors? Tutorial: How Do I Fix Computer Hard Drive Errors? Many factors go into how efficiently a computer processes information, but few are as important as keeping hard drive with minimal errors through free computer maintenance. A computer processor, RAM and a hard drive all work in concert to deliver an interactive experience. Computers can slow down over time even if a computer accesses only a few program in its lifetime. Understanding how a hard drive writes and searches for information is an important computer efficiency concept. A beginning computer user can use this concept as well as other computer maintenance ideas to retain peak computer performance. Computer hard drives store binary data in a format similar to that of an audio CD or floppy disk. Compact discs use high energy lasers to burn microscopic pits in the smooth areas of the disc. These pits have only two binary designations for information storage. These pits are then read by a CD-ROM drive which allows computers to play music or video from a compact disc. This method stores much more information than a floppy disk but is also a more permanent way to store information. Floppy disks store information in a similar manner, but unlike compact discs this information can be easily and quickly erased or modified. Like floppy disks, hard drives magnetically store information on hard disk platter, also known as a disk. A hard drive can have multiple disks that all work jointly to facilitate efficient data transfer. Hard drive disks spin between 3,000-15,000 RPM depending on what kind of performance a user requires. The partitioning of hard drives involves units of measure known as sectors. While a sectors only encompasses 512 bytes of information, errors can spam over thousands of sectors causing major computer slow downs or operating system failures. Due to the magnetic nature of information storage, damaged sectors are impossible to stop and will only grow over time if no steps are taken to curb the number of hard drive errors. Placing a magnet directly on a hard drive or floppy disk will irreversibly destroy saved data, but smaller magnetic disturbances or manufacturer defects lead to hard drive sector errors. Another hard drive characteristic to be familiar with is the location of information storage. When saving files a hard drive does not necessarily record files in an orderly fashion. Files are saved according to where free disk space is available. Over time a hard drives efficiency drops as files are spread over various parts of each hard drive disk. Time is wasted while a hard drive retrieves information required to complete a process. Slow load times and computer crashes are common when information is spread over various physical locations on a hard drive, especially when information is located on a corrupted sector. Microsoft Windows operating systems can sometimes detect hard drive sector errors with free computer maintenance while performing normal tasks like saving or deleting files. Microsoft Windows operating systems are however unable to detect all sector errors, even with free computer maintenance. Every time an error is found a computer’s efficiency is negatively affected due to the amount of time lost in the process of recognizing an error and recording its existence. More time is wasted if Microsoft Windows operating systems are unable to detect hard drive sector errors and attempts to write, delete, or modify information is made. Saving information on erroneous sectors leads to data corruption that causes multiple problems including computer performance issues. There are several built-in computer maintenance Microsoft programs that address inherent hard drive error issues that any user can run at any time. Both Microsoft Disk Defragementer and Scandisk allow any level of computer user to perform hard drive maintenance. Weekly use of Microsoft maintenance programs like Disk Defragmenter and Scandisk helps ensure peak computer performance. Microsoft recommends running these maintenance programs with the installation of new programs or an operating system upgrade. Scandisk and Disk Defragmenter scan a hard drive and correct any sector errors or other types of hard drive corruptions. Along with error corrections, Disk Defragmenter consolidates similar sectors into one area on a hard drive to allow faster information access. Use the following instructions to run computer maintenance programs known as Scandisk and Disk Defragmenter in order to reduce the number of errors on a hard drive and increase computer efficiency. 1) Click on the “Start” button found on the main menu bar. 2) Select “Computer” or “My Computer” depending on which version of Microsoft Windows running. 5) Ensure the check boxes labeled “Automatically fix file system errors” and “Scan for and attempt recovery of bad sectors” are checked. 6) Click on “Start” to begin repairs. 2) Select “Programs” or “All Programs” depending on which version of Microsoft Windows running. 4) Click on “Disk Defragmenter” and select “Defragment” in the new “Disk Defragmenter” window.